The college admissions scandal has been full of wonderful teachable moments – about ethics, humility, greed and corruption. Now for asset hunters there is a new nugget today: overpaying on purpose. As the Boston Globe reported yesterday, a municipal home assessor found it odd that a home in Needham, Massachusetts (near Cambridge, where Harvard is) sold for close to a million dollars even though it was assessed at $549,000. Why would someone overpay so much? The mystery deepened when the buyer sold the home 17 months later for a loss of $324,000. It turns out the seller was the coach of Harvard’s fencing team. The buyer was a man whose sons were on the fencing team. Now Harvard has launched an independent review of the transaction. What does all of this have to do with asset searches? Simple. One easy way to hide assets is to overpay for something and then get your money back later from the buyer. It works as long as the buyer is someone you trust. That’s why we always ask clients for lists of trusted friends and associates of whomever we are looking at. Husband pays $1 million for a racehorse worth $200,000. Seller of horse is his college friend. College friend holds the $1 million, and the plan is to give his friend back the $800,000 after the divorce is finalized. Of course, in the Harvard case above, it may be that the coach gave out admissions favors instead of excess cash, but the principle is the same: overpay for something in order to get something back in secret. We always want to know who owns the home, the office, the vacation place of anyone we look at. It can sometimes be a trusted friend holding the asset for them, or a company controlled by the occupant. And if someone grossly overpays, that’s a red flag, whether you’re looking for cash or a spot at a famous university. At some point with nearly every asset search our firm conducts, we end up telling clients that finding assets is often more than a one-step process. The one step some people think we need to take is to consult some databases, and voila! A pot of gold they can easily seize. While there have been times when we discover real estate ownership in the name of the asset concealer, our clients in these cases usually agree that if their spouse is so careless about the houses, there must be much more money being carefully hidden. At least one study we have written about before indicates that most divorcing men hide assets. The truth is that a successful asset search sometimes doesn’t seem successful to clients who expect an easy grab. We recently did a search and came up with a two-month old company formed by the person we were looking at. It owned no real estate that we could see and had no liens against it. Our client was disappointed, but I had to tell her that this was potentially good news. If someone is hiding assets, they would be silly to stick cash in the bank in their own name. Of course, you need to subpoena all the accounts you know about, but the big money will often be hidden in the name of a company you don’t know about. Finding the name of that company is half the battle. Then, you need to find out where that company may have a bank account. With whom has it done business? Does the person you are searching have a favorite bank or banks? Any business liens at a bank we haven’t seen before in his affairs? Is there a computer we can look at (legally) that could tip us off? We cannot stress often enough that there is no legal way for us to consult a database and get a list of someone’s bank or securities accounts. You need to go bank by bank with a court order once you are in discovery or have a judgment. If an investigator tells you he can get you this information with “connections,” he is telling you he will break the law. See our post about that called Can You Get Me Bank Accounts and Some Cocaine, Please? Sometimes, we find the names of new companies domiciled in other countries. That’s good news, potentially, but getting discovery of those company accounts can be expensive, depending on the jurisdiction. If you are owed a lot of money that can be worth it. But going all-out to get $50,000 in the British Virgin Islands probably won’t be. Asset searches can work out well if, while being as aggressive as you can be, you exercise patience when needed and follow the rules. The answer we give is that we are not forensic accountants, but you probably need us anyway because forensic accountants don’t do what we do. And, you may need a forensic accountant as well. Fact-finding and forensic accounting go together to give you a much better shot at finding assets than either function working alone. One forensic accountant we have worked with on assignments describes some of her practice as including corporate fraud investigations, [and] lifestyle analysis for divorce and child support. What won’t this forensic accountant do? Exactly what we will: Searching the globe for hidden assets and conducting interviews. A forensic accountant can do a brilliant job analyzing the flows of money into and out of a business to see if funds are leaking to private accounts they shouldn’t be touching. But what happens if you don’t know that a business is linked to the person whose assets you are searching? As an example, we were once asked to find assets of a husband who had controlled some 30 businesses owned by him and his wife. She knew little to nothing of how it all worked, but when they were divorcing, things followed a customary pattern. The businesses had a “bad year” and showed greatly reduced earnings and assets. What to do? We were hired first and concluded after a week’s work that the husband was hiding what were probably his most profitable companies (over a dozen of them) while showing his wife’s lawyer the money-losers. Our advice: Subpoena the missing company financial records, and then get a forensic accountant to tell you if the fuller financial picture makes sense. Asset searching and accounting are specialties. You don’t ask your lawyer to fix your roof, and you don’t ask your plumber to draft a will. When two jobs are different, two heads are better than one. Nearly ten years on since the arrest of master Ponzi schemer Bernard Madoff, the Ponzi fraudsters are still with us. Maybe not with as much money as Madoff’s billions, but powerful enough to do a lot of damage. Being devoted to finding assets, this blog doesn’t usually talk about ways to lose them. But we have had asset searches in which we suspect money was lost in a Ponzi scheme. The schemer may have assets, just not as many and not in the hard form the investor thought were there. It never hurts to remind ourselves of what Ponzi schemes are and how to check to see if one of them is coming for you and your money. We’ve written here about some of the warning signs that alerted plenty of smart people that Madoff was too risky. Sadly, those signs and repeated whistle-blowing to federal regulators failed to prevent massive losses by investors, as Madoff’s scheme went on and on. Other Ponzi schemes are easier to spot. The Securities and Exchange Commission defines a Ponzi scheme as “an investment fraud that involves the payment of purported returns to existing investors from funds contributed by new investors.” Also known as pyramid schemes, they are named after Charles Ponzi (below) who swindled people in the U.S. in the 1920s before his get-rich-quick fraud collapsed. Combined with various kinds of fraud we’ve dealt with as well as the Madoff experience, we offer some signs that an investment opportunity you are offered may be one to be avoided. Length of the investment enterprise. Madoff’s decades-long Ponzi operation was unusually old and added to his trustworthiness, but many Ponzis are much shorter-lived affairs. According to a paper Who Gets Swindled in Ponzi Schemes? the average lifespan of U.S. Ponzi schemes prosecuted between 1988 and 2012 was four years. Charles Ponzi’s racket lasted just one year. If your supposed investor can show you no track record or one that’s just a year old, be on extra-careful alert. Promise of outsized returns. While Madoff cleverly promised low but rock-steady returns (also extremely difficult to pull off for real), the average Ponzi scheme in the sample above promised between 111 percent and 437 percent returns. The lower the promised return, the longer the scheme can on, as long as new investors keep coming in. If it’s a very high return, especially if it’s “low risk,” the old “if it’s too good to be true, it’s probably not true” applies. If they aren’t asking for millions, it’s probably not a fraud, right? Wrong. The average investment in Ponzi schemes between 1988 and 2012 was $431,000. Half of all investments in Ponzi schemes were for less than $87,800. Sometimes you don’t have to crunch numbers to realize you’re being courted by a crook. The main reason we concluded one of our clients had been taken by a Ponzi scheme was that the companies he had invested in didn’t even exist. We are self-serving when we say this, but it could help you too: If you are prepared to invest $100,000 to earn another $50,000 or to double your money, why not take one or two percent of that and spend it on some due diligence? Investors in Madoff and the other schemes would have saved themselves a world of heartache. Clients who hire us for asset searches always want to know what we find. As often as not, the big news after an asset search is when we don’t find something we should be seeing but are not. No major accounting firm auditing what purported to be a multi-billion-dollar fund. No regulatory filings in the last couple of years that reflected billions of dollars in holdings. Computer programs are terrible at telling you what they should be seeing but are not, which is why so many investors never clued in to the Madoff risks that many experienced professionals noticed. A man who claimed to put no money in any financial institution, yet whose computer showed a browsing history at two-dozen brokerages. You can keep your money out of banks, but still on deposit with Schwab or TD Ameritrade. Next step: 24 subpoenas to those brokers. A divorcing husband’s loss-making entity that did no business (zero sales) yet persisted in paying one employee $75,000 a year. And, bank accounts showed the business paid plenty of taxes. Both of these fit the common scenario in divorce: appearing to have fewer assets that you really have. In the first case, the husband hoped to get money out of his brokerage after the divorce was final. In the second, the company may have been in partnership with another company that was holding back the first company’s share of the profits until after the divorce. The second company could also have been owned by the husband or trusted friend or relative. As with the Madoff fraud, a computer program did not point to either of the divorce cases above and spit out a “High Risk” or “Possible Asset Concealment” result. Instead, both findings were the product of hours of slow and careful research. The next time you wonder why an asset search takes hours and not just the feeding of a few names and numbers into a database, remember: Databases tell you (sometimes) what’s there – not what isn’t. Finding assets can be satisfying work, but frustration sometimes comes in realizing that a client’s lawyers haven’t been asking the right questions in their depositions. We have written repeatedly that getting bank account information without a court order is illegal (other than discovering it on a shared computer or in records lying around). When we are looking for assets before a lawsuit has been filed, getting at bank records is a long shot, and what we look for are banks and brokerage accounts our clients’ lawyers can ask about when the time comes for discovery. But how unfortunate it is when a client has been through discovery, or perhaps has a divorce agreement the former spouse is cheating on, and we find out that the lawyers never asked the right question. Not long ago, a woman came to us and asked us to find out where her ex-husband is working. We found convincing evidence that he was still employed at the same company as he had been during the divorce. At the time, his boss had been deposed and told our client’s lawyer that the ex-husband was making a paltry amount of money. This seemed unlikely given his title and his history of high compensation. When we looked at the deposition transcript, it turned out that the boss had never been asked about beneficial ownership of companies. It can work this way: instead of paying Mr. Jones his full salary, it pays Mr. Jones a small amount of money so that Mr. Jones can look as if there’s not much money to go after. The real money goes to Alpha LLC, a company Mr. Jones controls. Alpha LLC may have an agreement with the company that it will supply Mr. Jones’ services, for instance. Companies don’t care how they pay you as long as they account for all of their payments and withhold the right amount of taxes and other government payments. If they are public and Mr. Jones is a major executive, they may have to disclose the compensation arrangement in securities filings. But if they are private, they don’t have to tell you about those payments to Mr. Jones’ side companies, trusts, or other vehicles. Unless of course they are under oath and you ask them. How to Read Email Headers: Where Did That Email Come From? 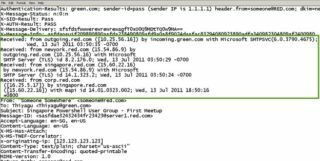 In brief, the header describes the route an email takes from sender to recipient, sometimes bouncing eight or ten times across the internet in the space of a second or two. It’s composed of a series of internet protocol (IP) addresses –unique numbers assigned to servers that handle your computer traffic. Most people don’t know the header is there and how to read it but it’s worth learning and it doesn’t take long. Wouldn’t it be nice to know if Tony is in Bermuda, Isle of Man, Grand Cayman or Cyprus? Figuring out where to look at overseas assets is sometimes a crapshoot because the money could be anywhere. If you knew where someone banked abroad, you would have a wonderful head start. It sounds too good to be true, and while header information can be a goldmine, there are some cases in which it won’t cough up the full story. If your subject is using a virtual private network (VPN), he is able to mask the true location of his computer at the time he sends the email. Also, even without a VPN a Gmail account will often suppress the IP address linked to the sender of the email (but sometimes the location of the sender’s cell phone or server will come through even with a Gmail account). On the other hand, in the example above a Bermuda banker is unlikely to be using a Gmail account, because Google admits to reading the contents of Gmail for marketing purposes. Not what a secretive offshore banker would want. Most importantly, you must remember that to see the email’s header, you need the original email. If someone forwards you an email the header information from the one they are forwarding will be lost to you. You will only see the header information of the forwarder. For someone to send you header information from an email they have received, they need to capture the header information and then send that to you. There are lots of free header analyzers available to decode the information. Once you have the IP address of the sender, you can do a reverse Google search for the location. But it may not end there. Say the IP address of the sender turns out to be a hotel in Paris. Only the IT department of that hotel will be able to tell you who was registered to the room responsible for sending the email from the hotel. For that you may need a court order or an investigator in France who can ask the hotel nicely. This is why we always recommend that when it would be helpful, clients in discovery ask not only for emails, but header information from those emails. One final word of caution: in the example above when you are looking at someone’s computer, you should only be looking at electronic information to which you have a right. Your lawyer can advise on that. As we tell our clients, if there is any doubt about whether you can look at a computer, you always have the choice of gathering the evidence without reading it and then asking a judge if you may look at it. If so, go ahead. If not, your damages will be much lower than if you plow ahead into forbidden territory. We’ve written plenty about why it makes sense to do an onshore search within the U.S. when you’re looking for offshore assets. See for instance our Offshore Assets Playbook and here. What comes as news to many clients is how secretive people are allowed to be with their assets right here in the U.S. Sometimes we find that the distinction between accounts in an overseas tax haven and one in certain American jurisdictions is meaningless until you have a court order. That’s why, when we are asked to do an asset search, we always ask whether the person contacting us is in litigation. If not, then finding indications of a bank account in the U.S. may not get you much more information than the same information about an account in Bermuda. It doesn’t mean you shouldn’t look. It’s just that without a court order, you won’t be able to get any useable banking information legally. The distinction changes once courts get involved. Then, it’s easier to break open the details of a bank account or even companies in Delaware. Overseas, you can get into the details in many tax havens, but it can be hellishly expensive. Only a very few of our clients have ever litigated in the British Virgin Islands. You need hundreds of thousands or sometimes, millions of dollars to be at stake to start spending the kind of money it takes to go to court in some of those places. Lawyers who hide assets in such places admit as much. The goal is to make identification so expensive that those looking will often want to cut a deal before spending all those legal fees. Another good reason to look onshore first. Just as offshore havens vary widely in the information you can get with and without court orders, so it is in the U.S. For example, Florida offers a lot of company information online, but in Delaware you can pay to have someone form and administer your company with a professional address. There will be no link to you in any publicly available information until you present the Delaware Secretary of State with a court order. Unless of course (and we’ve seen this) the person didn’t go to the small extra expense of having the company incorporated for him. If he did it himself, you can get the documents that link him to the company. It may cost a few hundred dollars, but in high value cases it’s always worth looking for all the public documents in Delaware just to make sure. Litigation. If your person did business with a bank, another person or company and things went wrong, he may have been sued. Even if he was doing business using the secret company, he could have been sued personally as well. That often happens if a borrower has to offer a personal guarantee for debt his new company takes on. Property. This can mean anything someone owns, but we especially like to look for real estate. Take every address you can associate with the person, and see who or what owns that property. Even if your man is renting, he may be renting from a company he controls. If your search for a landlord or owner ends at a lawyer’s door in Lichtenstein or a BVI company registered in Hong Kong, you’re getting warmer. Liens (called “charges” in many British-controlled jurisdictions). This is a search you can get done without a lot of money, but you need to know the name of a company to look at. Sometimes mysterious companies show up in someone’s email or on their computer hard drive. Finding out to whom your person owes money can lead to an interview with the creditor and lots more information. For women wondering whether their ex-husband (or soon-to-be ex) is hiding assets on them, rest assured that you are not alone. According to a new white paper put out by Francis Financial, a wealth-management firm that specializes in advising women, 63 percent of women the firm surveyed “felt strongly that their husband was hiding assets during the divorce process.” The firm says this was among the first such studies focusing on women who have divorced or are in the process of divorcing. Where to begin if you are one of those women? The study said that many who thought they were being cheated out of assets “had to grapple with the decision of hiring a forensic accountant,” and this may be an advisable step. We don’t start just by looking at what a woman thinks are the places her husband is hiding assets, because if you know where the stuff is, you don’t need us. If assets are hidden you may be surprised at where they turn up. We always like to give our clients a questionnaire that asks for all kinds of information about the person we’re searching. What might he name a secret company? What was the street he grew up on? Many hedge funds and private equity firms turn out to be named for the childhood streets of their founders. I know this because I always ask where these firms get their names. Don’t expect us to come up with lots of hidden cash. People hear “assets” and think “cash” because it’s the first asset listed on any balance sheet and the easiest to use once you get it. The problem is that in the U.S., it’s illegal to get bank account information without a court order. What we can do is find likely hiding places of cash, based on business relationships and other legal sources. One client gave us the home computer she and her husband used, and we found that he had visited about a dozen websites of asset management companies. These were ripe for subpoenas at the appropriate time in the proceedings. You don’t have to find every last penny to get some satisfaction. Once someone knows we have uncovered a significant portion of their hidden assets, their settlement offer can improve quickly. Some women have the means and the drive to litigate for years. Others just want a fair deal and to move on with money sufficient to take care of them and their children. Either way, asset investigations and a good forensic accountant are often worth considering. It may all come crashing down, but if it doesn’t the cryptocurrency market is your newest headache in trying to find hidden assets. Long written off by many as a joke, cryptocurrencies are still dismissed by many as a bubble waiting to burst. Just the other day, the Wall Street Journal ran this piece arguing that Bitcoin (the largest and original cryptocurrency) is way overvalued. Launched in 2009, Bitcoin was worth almost nothing for several years. At the end of 2013 it suddenly rose to almost $900, but then fell and never got back to that level until January of this year. Now, Bitcoin is worth $4,600, supposedly driven upward by residents of countries not thrilled by the prospect of devaluation of their home currencies, confiscation/destruction of other property, or both: Venezuela, Korea, and China lead the way, but you can think of other good candidates. Some true believers in Bitcoin think it should be worth $250,000 to $500,000 in 13 years, based on the idea that by design it can’t be inflated like paper currencies, and assuming cryptocurrencies get to just five to ten percent of the world’s share of payments (and that Bitcoin has about half of that cryptocurrency share). Most famous as a means for criminals to transact business with little trace, mention of Bitcoin has been enough to get you laughed out of the room in polite company. But what if $4,000 today could turn into $500,000 in 2030? Would your spouse want to take a chance with $25,000 to have more than $3 million later in life? Especially when it’s hard to trace? If so, read on. Cryptocurrencies are really nothing more than entries into a big database that record your purchase. The database uses something called blockchain technology, which ensures that the records are decentralized. The record is spread all over the chain and most importantly, once a transaction is confirmed it can’t be changed. Blockchain is for real, and many law firms are investing in it as the future of contracting. You can read more about its world-changing potential in the recent cover story of Fortune Magazine. How can you tell if someone owns Bitcoin or another crypto? There is no ownership record by name, necessarily. In the U.S. many websites that will sell you bitcoin have to take your name and other identifying information, but they will let you send the bitcoin anywhere you want — no names required. Privacy at other sellers is higher. If you buy bitcoin overseas, the transaction can be completely anonymous. For asset searches, the first thing to find would be evidence of dollars turned into bitcoin. Have there been bank or Western Union transfers to places named Coinbase (or anyplace with the name Coin in the title), GDAX, CEX.IO? Any cash coming in from such places to pay a few bills? Are there any records of such currencies inadvertently left around or on the computer you and your spouse may have shared? These currencies are in the end just strings of letters and numbers that look like this: 1F5tAaz5x1HUXrCTLbtMDqcw6o5GNn4xqX. If you see such strings, cryptocurrency could be involved. There are two ways people most often hold cryptocurrencies. Either on the website where they buy it, or on an electronic wallet (which is really just a mini-computer the size of a thumb drive that securely records their currency id codes). You may find such an electronic wallet, but more likely you will see evidence of computer traffic with one of the virtual wallets on the web. Keep an eye on Bitcoin. If the optimists are right, there could be millions of dollars of it to get if you can find it. The higher it goes, the greater the chance that the kinds of people who like to buy gold will have cryptocurrency too.